In India, many of the mammography centers use either Kodak or Agfa mammography films, but Kodak is the film which is used in large quantity. The information related to processor type, processing temperature/time, chemicals, film and pH of the processing solutions was collected by on-site visit to 30 mammography centers in Mumbai, India. From the survey results, wide variations in these parameters have been observed which are shown in [Table 1]. The present study investigates the effect of variability of these parameters, mainly changing the development temperature and time on the sensitometric indices like base plus fog, maximum optical density (OD max ), average gradient (AG) and speed of Kodak MinR-2000 mammography film. The aim of the study was to emphasize the importance of dark room QC procedures to be carried out by the technologists in the mammography centers of India as it is well established that daily QC program for the processing conditions will remove any discrepancy incurring due to processor related variables which may spoil the patient's film images, leading to retake. Totally 33 film strips were cut from a single Kodak MinR-2000 mammography film box. Assuming film to film variation is negligible, these film strips were randomly grouped together to form three sets comprising 11 film strips per set. A Victoreen dual color and dual control electronic sensitometer model 07-417 operated in the green spectrum was used to produce a 21-step sensitometric strip. Every subsequent step transmitted 40% more light than the previous step and was associated with an increase of a log relative exposure of 0.30. A set of three film strips was exposed using a light sensitometer for a given processing temperature and time. To examine the effect of varying development temperatures on the film sensitometric characteristics, these strips were developed in an automatic film processor [PROMAX™ , Chayagraphics (India) Pvt. Ltd., Bangalore, India] with Rolex processing chemicals, which has an outer knob for temperature control. The processor model has a constant development time of 1.5 minutes. 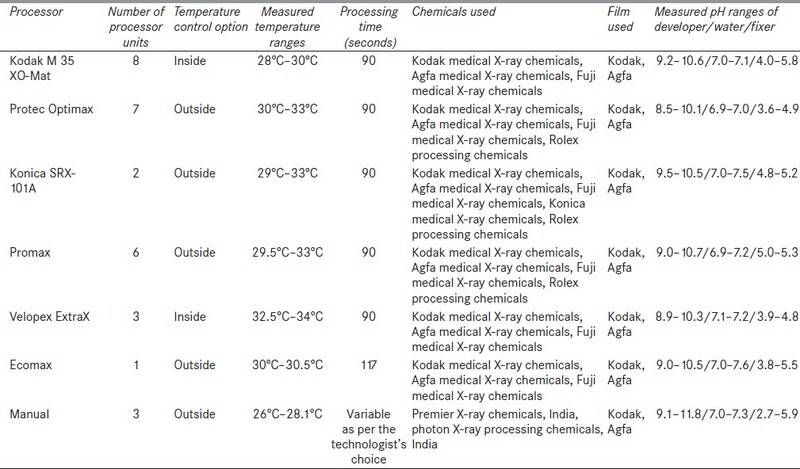 As the variation of development time was not possible in this automatic processor, a manual processing facility with Kodak chemical was employed to study the effect of varying development times on the film sensitometric characteristics at a constant development temperature of 26°C ± 1°C. The manual processing facility comprises three anti-corrosion steel tanks, each of 30 liters capacity, which were separately mounted on the stands made up of iron rods. A digital thermometer having 0.1°C resolution and ±0.2°C accuracy was used to measure the temperature of developer, water and fixer solutions. A pH meter having the range of −1.0 to 19 pH, resolution of 0.1 pH and accuracy of ±0.1 pH was used to verify the pH of the developer, water and fixer solutions. The OD is defined as the logarithmic ratio of the incident light intensity to the transmitted light intensity. For measurements of the OD of the film strips, a standard diffuse transmission Optel Trans-4 densitometer having white light source and an accuracy of ΔD = ±0.01 was used. To study the sensitometric indices of a mammography film, Hurter and Driffield (HandD) curves were plotted for three film strips corresponding to one set of processing conditions. This densitometer was calibrated to photographic density strip standards traceable to NIST, USA. Characteristic curves were measured for five different development temperatures and six different development times. The base plus fog level, OD max , AG and speed were calculated from the characteristic curve of each film strip. For a single set of processing conditions, three film strips were analyzed as we have processed the three film strips in a single processing condition. The mean values and standard deviations of these three film strips data were calculated. A base plus fog level of more than 0.20 OD is generally recommended as unacceptable. Therefore, measurement of this parameter is most important. The base fog density is defined as the OD of an unexposed film simply after fixing the film, whereas the base plus fog density is referred to as the density of unexposed film when it is subjected to the complete film processing cycle. The AG of the characteristic curve is an indication of the contrast of the film. The AG is determined by the slope between the two points with an OD of 0.25 + base plus fog and an OD of 2.0 + base plus fog. The required AG for a mammography film is ≥3.0. Speed is used to evaluate the film sensitivity. Speed is defined as the inverse of the log relative exposure required to achieve an OD of 1.0 + base plus fog. The maximum OD which can be produced on a film is called its OD max and its specified limit for a mammography film is ≥3.0 OD. [Figure 1] shows the characteristic curves of a Kodak MinR-2000 mammography film at five different development temperatures (32°C, 33°C, 34°C, 35°C and 37°C) and a constant development time of 1.5 minutes. [Figure 2]a-c show the measured variation in the AG, speed and OD max of the film at five different development temperatures, respectively. 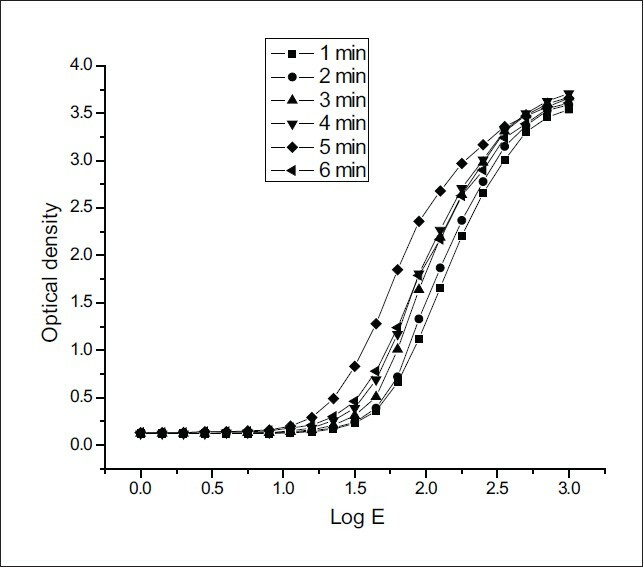 [Figure 3] shows the characteristic curves of a single emulsion Kodak MinR-2000 mammography film at six development times (1, 2, 3, 4, 5 and 6 minutes) and a constant development temperature of 26°C ± 1°C. [Figure 4]a-c show the measured variation in the AG, speed and OD max of the film at six development times, respectively. The base plus fog levels of the film strips were not adversely affected with change in development temperatures and times involved in the study. Although not shown, the constant base plus fog level of 0.11 ± 0.00 was recorded when the development temperature was varied from 32°C to 37°C. For the development times between 1 and 4 minutes, the base plus fog level was 0.11 ± 0.00 and for the development times between 5 and 6 minutes, the base plus fog level had a single value of 0.14 ± 0.00. The AG for the developing temperatures and times is presented in [Figure 2]a and [Figure 4]a, respectively. When the developing temperature was increased from 32°C to 34°C, the average film gradient decreased from 3.29 ± 0.01 to 3.13 ± 0.005, respectively, at a fixed development time of 1.5 minutes. There was a rapid increase in average film gradient from 3.13 ± 0.005 to 3.4 ± 0.00 when the developing temperature was increased from 34°C to 35°C, which means an increase in contrast level of 23%. When the developing temperature was increased from 35°C to 37°C, there was a rapid decrease in the AG of the film from 3.4 ± 0.00 to 2.48 ± 0.01, which means a decrease in contrast level of 37%. The average film gradient increased from 3.05 ± 0.005 to 3.27 ± 0.01 when the developing times were increased from 1 to 3 minutes at a fixed development temperature of 26°C ± 1°C. The AG started decreasing from 3.27 ± 0.01 to 2.66 ± 0.02 when the times were increased from 3 to 6 minutes. The values of speed for the different temperatures and times are shown in [Figure 2]b and [Figure 4]b, respectively. A rise in temperatures from 32°C to 37°C had an appreciable impact on the speed of a film which increased from 0.015 ± 0.000 at 32°C to a maximum value of 0.0236 ± 0.000 at 37°C, which means a decreased radiation level of 56%. At a fixed development temperature of 26°C ± 1°C, the speed increased when the developing times were increased from 0.011 ± 0.000 at 1 minute to a maximum value of 0.025 ± 0.000 at 5 minutes, which means a decreased radiation level of 25%. At a development time of 6 minutes, the speed of the film was measured as 0.017 ± 0.000, which means an increased radiation level of 48% when compared with maximum speed obtained at 5 minutes development time. 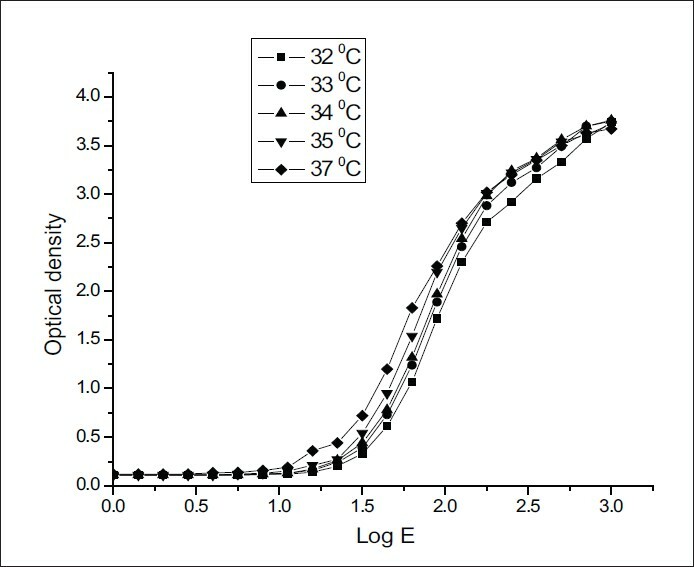 The OD max values produced on a film for the different temperatures and times are shown in [Figure 2]c and [Figure 4]c, respectively. A rise in temperature from 32°C to 37°C shows the increase in OD max of a film from 3.74 ± 0.01 at 32°C to a maximum value of 3.76 ± 0.05 at 34°C. 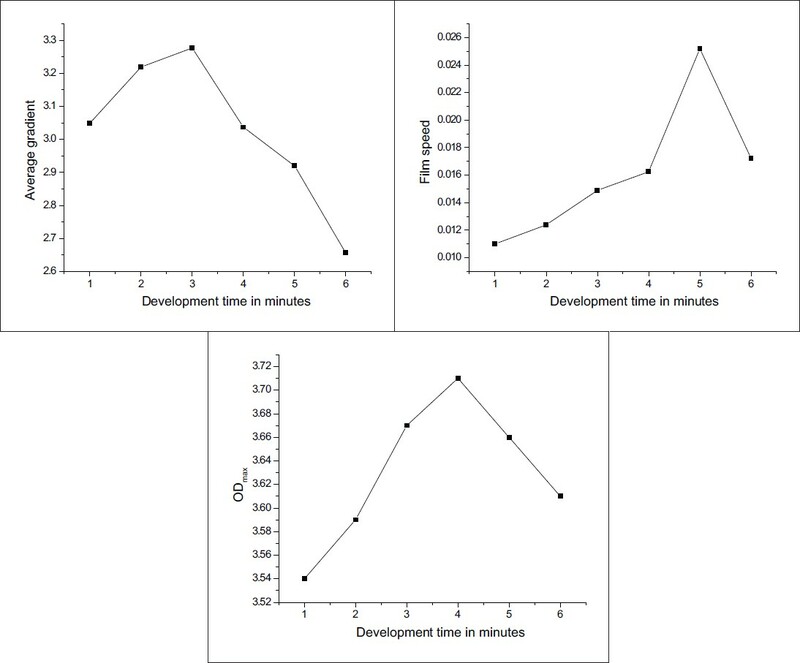 When the development temperature was increased from 34°C to 37°C, the OD max decreased from 3.76 ± 0.05 to 3.67 ± 0.02 as shown in [Figure 2]c.
At a fixed development temperature of 26°C ± 1°C, a rise in development time from 1 to 6 minutes had an appreciable impact on the OD max of a film as it was increased from 3.54 ± 0.03 at 1 minute to a maximum value of 3.71 ± 0.01 at 4 minutes. When the development time was increased from 4 to 6 minutes, the OD max decreased from 3.71 ± 0.01 to 3.61 ± 0.05. The observed OD max values did not show much significant change with the applied processing variables. Alteration in the sensitometric indices, for example, AG, film speed and OD max of a mammography film, due to influence of development temperature and time can be seen in the present study. In this context, it may be noted that Tsalafoutas et al. had made an investigation to study the variation of the seven mammography films with processing conditions and showed that the different mammography films presented different sensitometric characteristics that could be altered by the processing conditions. It is evident from the present study that for the investigated film and the processing variables, the best development temperature range is 32°C-35°C for an automatic processor cycle time of ~1.5 minutes, as on these settings the AG requirement needed for a film has been optimized. In case of required film speed and OD max values, the above-said temperature settings are again considered to be the best choices. Also, it can be seen from [Figure 4]a-c that the best suitable development time range for the manual processor setting applied in the study is 3-5 minutes for getting the optimized parameters investigated, for example, AG, film speed and OD max. Sensitometric characteristics of the Kodak MinR-2000 mammography film were evaluated with varying processing temperatures and times as in most of the surveyed centers it was observed that the measured and set temperature on the processor varied by more than 5°C. Even the temperature control system of the processors was not working in many of the facilities. It was also observed that at some of the places, manual processors were in use which had contributed large variation in the development time of mammography film. It was also observed that replenishment rate of the developer solutions was inadequate which resulted in a rapid decrease in the concentration of the developer solution. The use of a common processor for processing the radiography films (X-ray radiography and mammography) of radiology department was found to be the major reason for the inadequate replenishment. Also, at a few centers, it was observed that the pre-used and exhausted developer solution was sent back to the machine as replenishment. This mammography film is widely used in most of the mammography departments and shows the influence of processing conditions on its sensitometric characteristics. Although a single type of mammography film was used in this study, the effect of processing variables on any type of mammography film cannot be excluded, which brought the changes in its sensitometric indices due to varying processing conditions. In-depth analysis of sensitometric characteristics of a film from the contrast and radiation level point of view shows that there is a need for each mammography center to carry out sensitometric study for their film and development chemistry to optimize the image quality and radiation dose levels. Further, in India, where the workload for routine radiography is much significant in comparison to mammography workload, it becomes impractical to have a dedicated mammography processor. With the use of a common processor, it becomes utmost important that the processor undergoes daily QC check and a record for the same is maintained and analyzed because the use of a common processor results in rapid decrease in the concentration of the developer solution if the replenishment rate is inadequate. It was also observed that none of the facilities were having processor QC equipments like sensitometer, densitometer, pH meter and digital thermometer. While interacting with the mammography technologists working in these centers, it was found that majority of them were not aware about the mammography QC procedures. Considering the importance of mammography QC program for dark room procedures, it is advisable that the frequency-based QC program should be initiated at a national level in every mammography center involving mammography technologists. Authors wish to express their gratitude to Dr. A. K. Ghosh, Director, Health, Safety and Environment Group (HS and EG); Dr. D. N. Sharma, Associate Director, HS and EG, Dr. G. Chaurasia, Head, Medical Physics and Training Section, RPAD, Bhabha Atomic Research Centre, Mumbai, for their encouragement and support. Authors also express their sincere gratitude to the staff of mammography centers for their help in measurements. 1. Jacobson DR. Mammography radiation dose and image quality. Radiat Prot Dosimetry 1998;80:295-7. 2. Brink C, de Villiers JF, Lotter MG, Vanzyl M. The influence of film processing temperature and time on mammographic image quality. Br J Radiol 1993;66:685-90. 3. The European protocol for the quality control of the physical and technical aspects of mammography screening. 3 rd ed. Luxemburg, 2001. 4. West MS, Spelic DC. Using light sensitometry to evaluate mammography film performance. Med Phys 2000;27:854-60. 5. Kimme-Smith C, Rothschild PA, Bassett LW, Gold RH, Moler C. Mammographic film-processor temperature, development time, and chemistry: Effect on dose, contrast and noise. Am J Roentgenol 1989;302:35-40. 6. AAPM report No. 29. Equipment Requirements and Quality Control for mammography. 1990. 7. Murray JG, Dowsett DJ, Laird O, Ennis JT. Assessment of mammographic film processor performance in a hospital and mobile screening unit. Br J Radiol 1992;66:1097-101. 8. American College of Radiology. Mammography quality control manual for radiologists, radiologic technologists and medical physicists (Reston: ACR) 1999. 9. Sharma R, Sharma SD. A quality control programme for medical X-ray films in India. Radiat Prot Dosimetry 2012;148:51-7. 10. Tsalafoutas IA, Dimakopoulou AD, Koulentianos ED, Serefoglou AN, Yakoumakis EN. Variation of sensitometric characteristics of seven mammographic films with processing conditions. Br J Radiol 2004;77:666-71.